I found this post from 2016 hidden as a page ‘backstage’ if you like? So I have updated it and turned it into a published post, the story of our ever evolving kitchen and home. I have stirred in a little bit of pattern and added an ‘Industrial edge’ and of course as usual in our house, there are lots of handmade and vintage finds too. Industrial Boudoir: black, white, red and blue with a hint of yellow. I would describe the style of our kitchen as ‘Industrial Boudoir’ (yeah I just invented that? ) I enjoy mixing it up, kitchens can often be cold and clinical, as can bathrooms. So, I have stirred in a little bit of pattern and added an ‘Industrial edge’ and of course as usual in our house, there are lots of handmade and vintage finds too. Where to start? 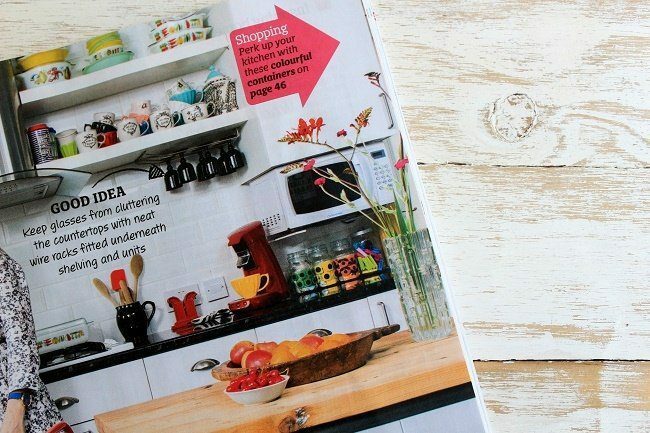 Perhaps that day approximately 4 years ago when I decided I despised our overhead cupboards so much, that I would rather have bare walls than look at them for one minute longer! So I unscrewed them all and took them off the walls (by myself, it wasn’t easy ) then dumped them on the driveway. It felt sooo good. Marc still laughs about the day he came home to find half the kitchen on the drive. However I completely forgot about the fact that at that time we had no budget to spare for new anything, let alone new kitchen shelves. So we decided to tile the bare walls with the cheapest tiles we could find, good old white subway classics to the rescue! We used our Tesco vouchers to pay for those! We then reused some old ikea shelves from other rooms, cut them to fit and popped them up. Perfect to display the vintage Pyrex, it looks superb on display and lit up at night. We were given some black off-cut worktops. Nothing fancy but they went with the tiles! Ebay provided a cheap extractor hood in stainless steel. IKEA had a sale so we bought glossy white fronts for the remaining units. Marc then painted everything else white. 3 blue glass lamps were found for £2.00 each in the B & Q sale. So far so good. I then rescued a gorgeous vintage old school chair from a skip (with permission) and Marc restored it to its former beauty. We were given some black off-cut worktops. Nothing fancy but they went with the tiles! 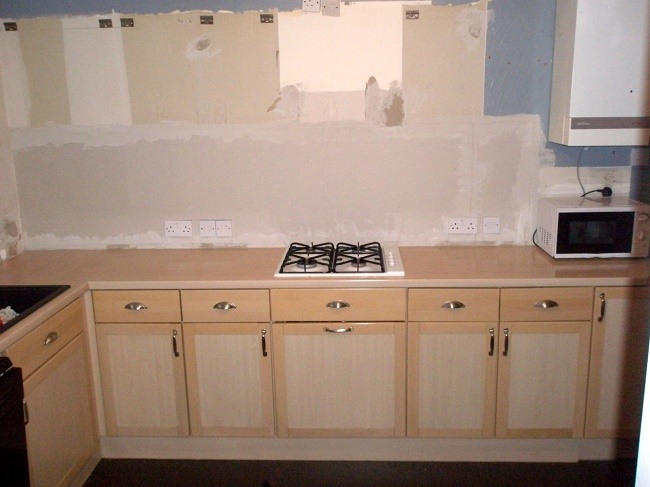 Total cost less than £700 for an almost complete kitchen makeover! 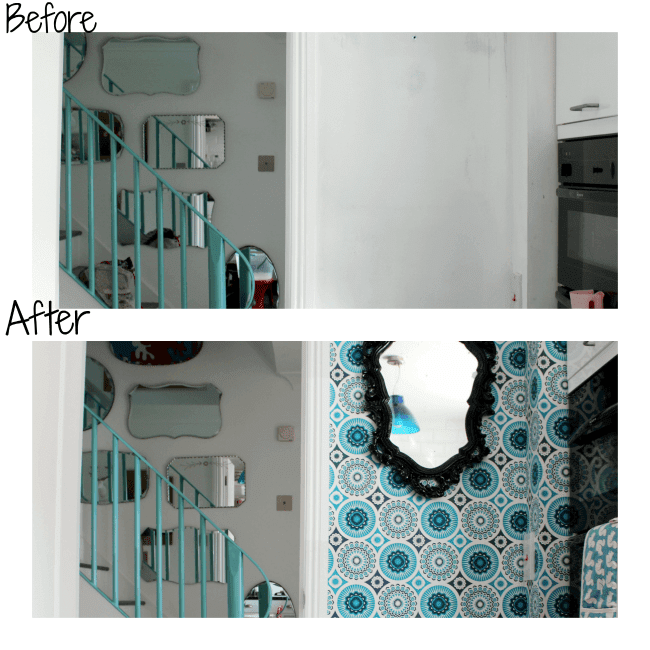 We later fell in love with and wallpapered two walls with Mini Moderns ‘Darjeeling’ design in the Lido colourway. Very retro, very busy, it was love at first sight. Marc bravely papered over the remaining 2 white walls and we all loved the result.It contrasted nicely with the two white tiles walls and brought everything to life. Then came the central kitchen, extra work-space table. Marc made it from pipes and our old garden table! The chairs hanging on the wall we already had. They are from Habitat and luckily they perfectly matched the wallpaper. This was the year we acquired new ‘jam jar lights’ from Iconic lights. Marc rewired them with vintage style blue flex and we added new led lights. Also this year Marc came up with the idea of fixing a sheet of metal up on the side of a cupboard that we could use as a magnetic noticeboard. Its huge and covers up a nasty side of a unit left over from before. Today I would NOT choose the subway tiles! But 5 years ago they were the cheap option. All in all this room has changed dramatically over the years and cost very little money. Of course if we were spending money I would have chosen differently, perhaps better quality materials. but it would still look very similar. Necessity really is the mother of Invention you know, from this to this …. what do you think of it so far? Future plans are being hatched as I type, those old ikea white shelves are in the process of being replaced. The tiles are having a bit of a makeover, like I said ‘ever evolving’… oh and plants there will be much greenery. It will look bit like these shelves in my office, Marc made the brackets. He has made already made black ones for the kitchen. I am hoping to get the new shelves up this weekend. I will soon be sharing new pics of our updated kitchen! Do sign up to receive my latest emails to your inbox, the form is below. Read more posts about our home. Our Dark grey bedroom was the star of the show in 2017! DIY How We Built Our Own bed. Do let me know in the comments section below if you want to see more of my own home? I used to frequently write about interiors and our restorations and I’m thinking about showing you more this year too! Finally, you must read this post from Catherine about bloggers helping Boggers ! 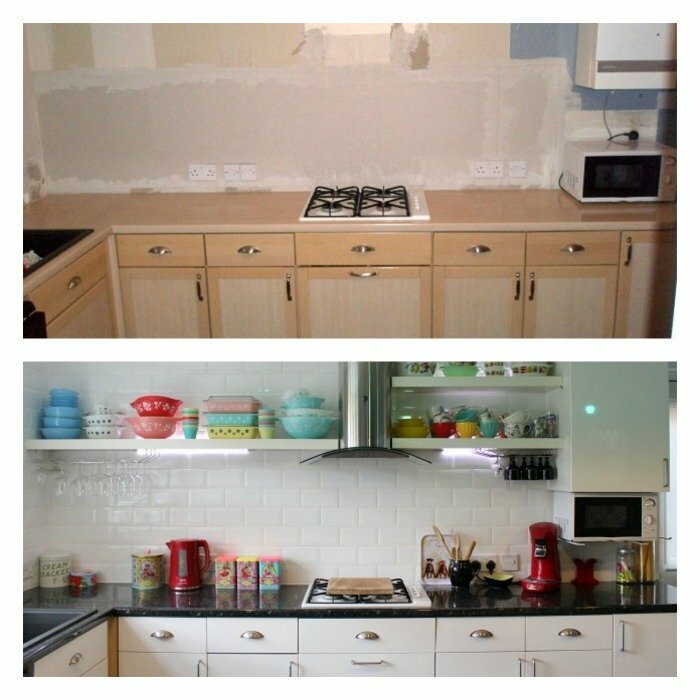 Your kitchen has come a long way! Looking forward to future updates. I still haven’t done much with mine other than changing a tap and the blinds. Hi Juan, yes always evolving! Hi Carolyn, great to hear from you. How exciting to have a new kitchen in the planning. We are only changing the shelving and spending a few pounds as usual. Marc is doing everything himself, he is so good at this stuff. I just point. Err, You know I’m going to be calling you for some help when I start decorating! I’m all boring creams and the usual monochromatic me! You know I’m here anytime to help you old gal! 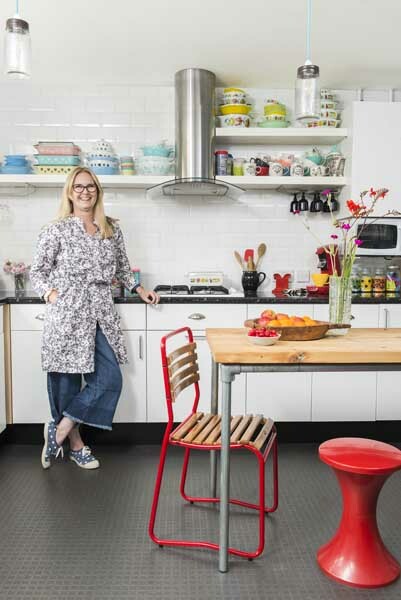 Love your kitchen & your blog. 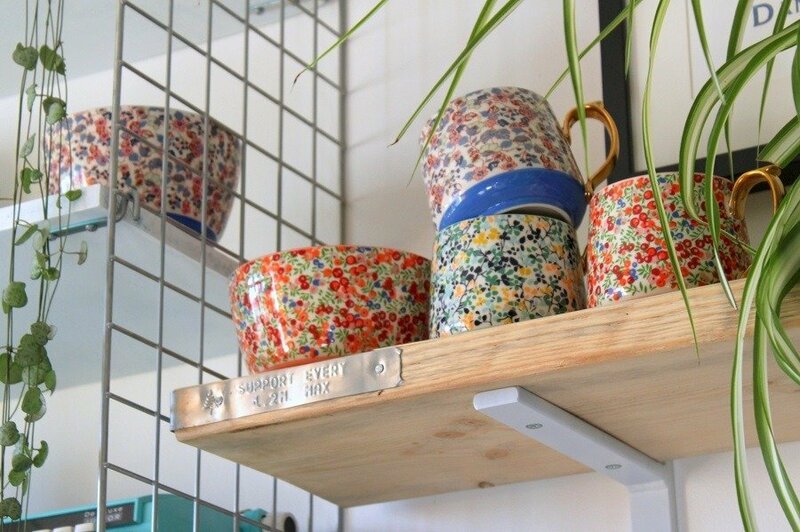 Like the open shelving – your vintage Pyrex are amazing. Hello Shirley, thank you so much for saying that ! Makes it all worthwhile! Those jam jar lights are fantastic! And the wallpaper too. 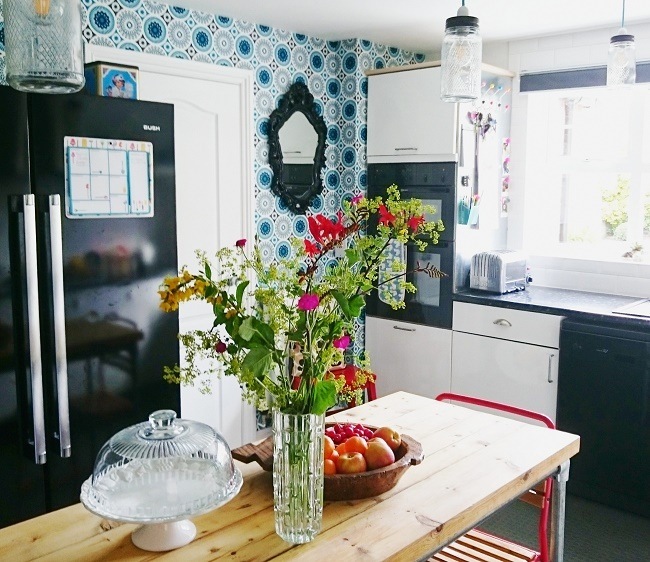 A very colorful cosy kitchen! Thanks Nancy You have excellent taste!